The University of Texas at Austin, often called UT or Texas, is the flagship institution for the State Of Texas. The main campus is located less than a mile from the Texas State Capitol in Austin. Founded in 1883, the university is considered to be a "Public Ivy," and was the fifth largest single-campus in the nation by enrollment in the fall of 2005, with upwards of 50,000 students and 20,000 faculty and staff. The university also operates various auxiliary facilities located away from the main campus, most notably the J.J. Pickle Research Campus. Texas is a major center for academic research, annually exceeding $380 million in funding. In addition, the University's athletic programs are notable, as demonstrated by Texas's recognition as "America's Best Sports College" in a 2002 analysis performed by Sports Illustrated. In January 2006, Texas won the Division I-A national football championship by beating the USC Trojans in the Rose Bowl. The University of Texas at Austin has a network of over 450,000 living alumni, one of the largest of any American university. David Koresh was born Vernon Wayne Howell (August 17, 1959 – April 19, 1993). He was the self-proclaimed head of the Branch Davidians from 1988 until a 1993 raid by the Bureau of Alcohol, Tobacco, and Firearms and subsequent siege by the Federal Bureau of Investigation ended with the burning of Branch Davidian ranch, the Mount Carmel Center. David Koresh was born in Houston, Texas to a 15-year-old single mother. He never knew his father and was raised by his grandparents. Koresh described his early childhood as lonely, saying that the other kids teased him and called him "Vernie". As a young boy, he was abused by his stepfather. A poor student because of dyslexia, Koresh dropped out of high school. Article requests : Create an article from the needed articles list. *Add city infobox to all town/city articles missing one. *Add appropriate bio infobox to all Texas bio articles missing one. Featured article candidates : Category:GA-Class Texas articles, * No results were found. *Add a picture to an article in the list of requested photographs in Texas (Most towns in Texas are still on the list) or improve one of the articles with 0 or 1 images on the list of needed pictures. Coordinate with Texas Portal to provide quality articles for use. The Episcopal Cathedral Church of Saint Matthew in Dallas. 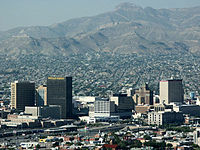 El Paso is the county seat of El Paso County in the U.S. state of Texas. According to the 2005 U.S. Census population estimates, the city had a population of 598,590, making it the sixth-largest city in Texas and the 21st-largest city in the United States. El Paso is second only to San Diego, California in size among all U.S. cities on the U.S.-Mexico border. Ciudad Juárez, Chihuahua lies opposite of the Rio Grande — which separates the two cities—forming a bi-national metropolitan area of 2,280,782, making it the second-largest bi-national metropolitan area on the U.S.–Mexico border. El Paso is home to The University of Texas at El Paso. Fort Bliss, a major United States Army installation, lies to the east and northeast of the city, extending north up to the White Sands Missile Range. The Franklin Mountains extend into El Paso from the north and nearly divide the city into two sections. You are invited to participate in WikiProject Texas, a WikiProject dedicated to developing and improving articles about Texas.